The presence of reliable overland routes was one of the necessary conditions for fixing the Siberian land to Russia as a result of Ermak’s campaign. Vishero-Lozvinsk’s overland route which had become official by that time had appeared very unsuitable to cope with the increased stream of people and cargoes. Beginning at the center of Perm Great Cherdyn’, it passed on the river Vishera and its affluent Velsu. Then travelers had to leave the vessels and go to the Ural Mountains by foot or on horse, then another part on water on the river Lozva. The route reached the small town Lozvinsk which played at that time a role of a reloading point, before further going deep into Siberia on the rivers Tavda, Tura, Tobol, Irtysh and Ob. In 1595 tsar Feodor Ivanovich published the decree to the "hunting people " to find a more direct and convenient way to Siberia. Artemiy Sofronovich Babinov was one of such people. We do not know a lot about his life. It is known, that Artemiy Babinov was a peasant by origin, was born between the 60s or 70s of the XVI century and lived in the village Verkh-Usloka located near Solikamsk (1). According to the legend, once he met Voguls (Mansi) near the Chan’vinsk caves, Where they were celebrating their pagan rites. Babinov unobserved proceeded behind them on a secret way, which went through the woods to the riverhead Tura. "He broke branches of trees, in order not to lose the way. So Artemiy Babinov found the way through the Ural mountains, and he reported to Moscow that he could lead directy on a land road which would reduce the way between Sol’-Kamskaya and Tobolsk, the capital city of Siberia. The highest consent was received." (13, 19). Construction of the road began in 1595 and continued during two years. 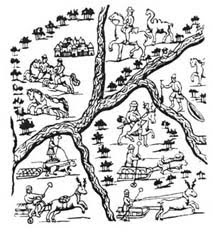 Under the imperial decree, Artemiy Babinov was given two Tselovalniks and forty peasants whose duties were to clear the road, and to build bridges over rivers encountered on their way. The road was about 260 versts (280 km) that was approximately eight times shorter than the former Vishero-Lozvinsk route. In 1597 the road reached the Voguls’ settlement Nerom-Kar located at the riverhead Tura. One year later on this place began the construction of the town Verkhoturye. For Artemiy Babinov investigation and construction of new roads became the issue of his life, subsequently continued by his descendants. Shortly, the new "tsar’s road" was built up to Tyumen and Tobolsk. During the XVII –and the first half of the XVIII century it was the only officially resolved route between the European part of the state and Siberia. First of all it was so because Verkhoturye’s customs opened in 1600, and all people going to Siberia and back were obliged to pass through it without any exception. During almost 150 years, the road named by the people "Babinov’s road", after its founder, played a main role in the development of the Siberian land. " Babinov’s road was as important as the world famous trading Great Silk Road from Varyag to Greece. It becomes clear if you imagine, as in the XVII century during the Russian development of the huge Siberian subcontinent, significant human carried weights, let alone immense volumes of cargoes, which arrived in Siberia through the narrow neck of Babinov’s road which had only a few meters in width... "(7, 147). Babinov’s road became one of the main links of the complex of the first Trans Siberian road laid by trailblazers to new, east boundaries of the Russian state. Today, the majority of these routes cannot be seen on modern geographical maps. Many cities and jails that were basic centers for a long time have lost their former value, and some of them seem even to have disappeared. However, today as part of the cultural-historical heritage of Russia, these ways continue to carry out a role similar to the original geographical routes with some traces of bygone epoch life. On these routes they are presented by monuments of material culture, a historical memory in the form of print and oral legends, as well as original features of outlook and the vital way of people living here. All together these components form a unique interconnected environment which can be grouped under the term "a cultural landscape". To understand the sense of separate historical phenomena or originality of the cultural traditions which still exist, it is first of all important to know about the inner world of the people who mastered east boundaries of Russia. One of the major roles in the early stages of Siberian development was played by the inhabitants of the Russian North. The well-known historian of Siberia P.A. Slovtsov, wrote: "Siberia is searched, extracted, occupied, and formed all by Ustyug’s people. They are farmers, coachmen, they have built us temples and bell towers, they began fairs." (23, 140). Even by quick look on a map of the Ural Mountains and Siberia, you can see an abundance of names the same as the names of settlements, which modern Vologda and Arkhangelsk areas have. So, the village Pinyagino in the Verkhotursk district, was founded by the idle people who moved to these lands in the XVII century from the area of the river Pinegi. The Povarennoe and Usolye villages, situated near Pinyagino, were originally populated by natives from Sol’vuchegodsk (16, 126). Near to the Ust’-Nitsunsk large villages during the XVII - XVIII centuries, among others, the villages Kaygorodova and Dvinka appeared whose names lead to the assumption, that their founders were natives of Kaygorodov and Podvinye (9, 141). In the second half of the XVII century the village Arkhangelskoye appeared in the territory of the modern Isetskoye of the Tyumen region. It was named so as its founders were from the Michael-Arkhangelsk male monastery located in the Great Ustyug. At that time, in connection with colonization of Siberia, the monastery was obliged to deliver food and bread in Zauralye. Its delivery, carried out on the Siberian route, took a long time and faced considerable difficulties and deprivations. Some of Ustyug’s people left their homes, did not come back any more and stayed to live in Siberia. The prior of Michael-Arkhangelsk male monastery addressed to the Tsar with the request to give the monks some land beyond the Ural Mountains, specially intended to produce food. In 1667 the ancestral lands of 280 desyatins (1 desyatin = 2.9 acres = 1.1 hectare) on the river Iset’ were given to the monastery. A.L. Yemelyanov, in his book "History of the Arkhangelskoye settlement " (6), analyzed the data from the population censuses recorded in the patrol book of Tobolsk Sofia House, and found out that many surnames of the first generations of inhabitants of the village who moved to Zauralye from Ustyug, Sol’vuchegodsk and Belozersky districts, are often found in the modern area of the Isetskoye district. The actual data in Yemelyanov’s book is evidence that certificates not only toponymic, but also a patrimonial trace which was left by people who moved from the Russian North into the cultural landscape of Siberia. Why did the inhabitants of Northern Russia become the main trailblazers of new, east boundaries of the country? What were the reasons? One of them is that during that time, Pomors-peasants, who were not serfs, had a freedom of movement and the right of an independent choice of residence (8, 136). The second reason was the high tension on the southern borders of the Siberian lands that is why a basic effort was devoted on developing the northern trading routes. 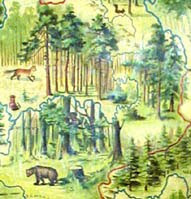 And, lastly, it is important to consider that remoteness of Pomorze from Central Russia, with a small population and a severe environment of these places, which have predetermined their extensiveness of the development, the basic role which was played by the distant trading communications interfaced with a structure of new transport routes and the development of adjacent territories. "How would the people of Ustyug feel, entering into strange taiga’s depth! What qualities were required for people to survive and resist in such a place, where obviously there was no other support, than their own forces. What characters could be shaped here! And today several hours of dialogue with native Ustyug’s people is enough to understand that they are Russians of a special breed. They are quiet and self-confident. Ustyug’s people do not express readiness to agree to any change to a life imposed on them without ceremony. They can accept it, but will not reconcile themselves to their fate." (20). A lot of the people who have become outstanding characters of domestic history have passed along Babinov’s road and other parts of the Siberian route. Among them - rebellious Abbakum, disgraced prince Menshikov, A.S. Pushkin's ancestor - Hannibal, outstanding scientists - members of expeditions of Vitus Bering, the first Siberian governors and metropolitans. In some cases, these historical figures have not simply passed on the Siberian route, but also have left their trace on it. In 1731 in the village Krasnoye, located in the vicinity of Solikamsk, Grigory Demidov established one of the first botanical gardens in Russia. In severe climatic conditions of the Northern Ural Mountains, in the greenhouses located in the grounds of a manor, strange cactuses and pineapples started to grow. "Owing to the unique position of Solikamsk on the Siberian path in an initial stage of opening and development of the Asian part of Russia, Grigory Demidov's botanical garden has helped a concentration of a scientific idea of that time not only with studying the vegetative riches of Russia that time, but also in defining the status of the most significant establishments of a science essentially advancing the time and cultures". (22, 27). Considerable aid was given to Grigory Demidov in forming this garden with members of the Second Kamchatka expedition of Bering - botanist I.Gmelin, S.Krasheninnikov and Steller. The life of the last of them came to the end on this road. In 1746 during a stop in Tyumen on his way to St.-Petersburg, George Steller caught a cold and died.